Products to consider for your next project. ​Bimba Stainless Steel Flat-I® Cylinders are designed specifically for applications that require compact cylinders that will be exposed to frequent, corrosive wash down as is common in a number of industries, such as, food and beverage or medical applications. The hygienic design includes a hard chrome plated stainless steel cylinder rod, stainless steel end caps, and a stainless steel, laser marked outer body assembled in a package that is easily cleaned by minimizing crevices that can retain application residue and foster the growth of unwanted bacteria. The end caps are also designed to eliminate catch points by limiting the number of mounting holes to only those necessary to mount the cylinder. Click here to download a full Stainless Steel Flat-I catalog. Acro 600 series pinch valves are designed to deliver compactness and affordability without compromising performance, Choose from three models that accomodate a wide array of tube sizes (up to 70 Shore A Durometer), ranging from 0.094" to 0.375" OD, and pressures up to 60 PSIG. Click here to download a full Acro Pinch Valve catalog. ​Humphrey's next generation technology of balanced poppet, direct-acting solenoid valves. The versatile 3- and 4-port line up is available in three sizes, addressing a multitude of pneumatic applications. ​​HIGH FLOW CAPACITY. Internal flow path management has been maximized. Coupled with the balanced design and an optimized solenoid magnetic circuit, significantly greater flow, within a reduced overall size, has been achieved. Click here to download a catalog. 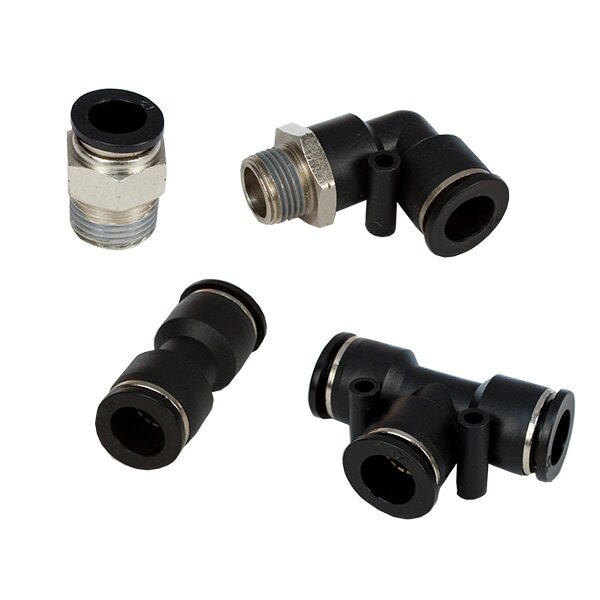 ​Pneumadyne’s composite push to connect fittings (or push-in fittings) are a quick and convenient method of connecting components in a pneumatic system. Designed for use with polyurethane, polyethylene, and nylon tubing, our composite push-in fittings are available in a variety of sizes to accommodate tubing ranging from 1/8 OD to 1/2 OD. Numerous configurations are available to meet your connection requirements. DID YOU KNOW? Pneumadyne composite fittings are priced lower than the competition, including brands like SMC, Festo, and Camozzi! We can cross-reference part numbers from all major brands! Call or e-mail today! ​Take the guesswork out of finding the right switch for your cylinder with Bimba’s EdgeSwitch™ Solid-State Switch Series. Designed to directly replace Reed Switches, EdgeSwitch™ features no moving parts for a longer, higher-performing lifespan. And every EdgeSwitch™ comes pre-tested for use with Bimba actuators––giving you a one-stop source for everything actuation. Improved performance: EdgeSwitch™ switches have only one detection zone compared to reed switches, which have multiple detection zones, reducing false triggers each cycle. Smaller operating window and hysteresis: EdgeSwitch™ triggers more precisely, leading to better edge detection, positioning, and more precise on/off timing than reed switches. Copyright © 2018 Reece Fluid Power Co.., All Rights Reserved.